Reports have emerged claiming that Chelsea have suffered a summer market blow with Xabi Alonso insisting he’s happy at Real Madrid. The Spanish international midfielder has been linked with a move to Chelsea if, as has been widely speculated, Madrid coach Jose Mourinho quits the Spanish giants and returns to Stamford Bridge at the end of the season. 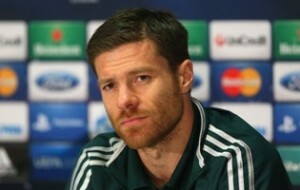 “Of course I’m going to be here next season,” Alonso said after victory over Malaga.